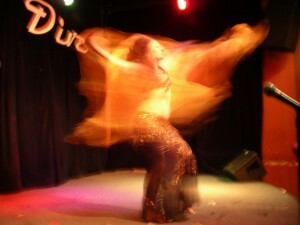 Beginning Belly Dance / Start here! Beginning course material draws from a huge library of techniques and the work covered keeps revolving. This is a good class to keep taking if week nights are not an option. They will not all be the same. Private classes are also an option for those who want to seriously learn the ART. Full course study or mini privates. This class includes the use of a weight belt, and hip scarf and printed notes are included. A 3 hour instructional DVD ($29.95) will be offered during class with a $5 off coupon. DVD’s are your best way to study at home between class. After you take this class you can go into these classes. The classes below are offered in 6 week blocks but you can join anytime and pay $15 cash per class.